Not sure if this is the right paint for you? 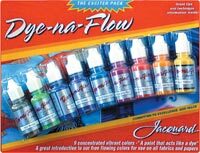 This assortment includes nine Dye-Na-Flow colors in 1/2 oz. sample size bottles. Colors include: bright orange, chartreuse, golden yellow, magenta, periwinkle, scarlet, sun yellow, turquoise and violet. It's the perfect way to try the paints out and get a feel for all of the amazing things they can do.